Another lovely purple creation, this one from Stephanie. 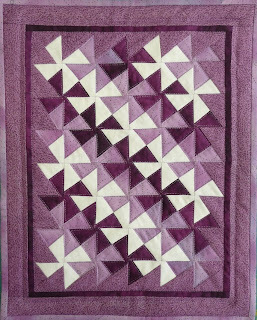 So many quilts are on the way to their new owners, even as I type - it's very exciting! Ooohhh... pretty! Someone's definitely going to enjoy that. Yay! I picked this one up at the post office today and I can tell you it is even more beautiful in person. Thank you, Stephanie. I will cherish it. Apparently there are a lot of us 'purple' lovers out there, 'cause there are sooooo many of you using that pretty color and this one is great!